Description: The column of this sea anemone is smooth, not divided into regions: acontia are present but not readily emitted. Tentacles slender, moderate in length, and not readily retracted. A small anemone rarely exceeding 10mm across base. Two colour varieties are known, both of which are illustrated. 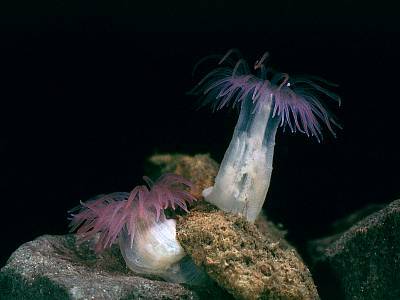 Reproduces by basal laceration- tearing off fragments of tissue from the base which subsequently develop into tiny anemones. Habitat: Attached to rocks in holes and crevices, amongst sponges, etc. Found on the lower shore and in the shallow sublittoral down to 10m. Distribution: Recently rediscovered in three localities on the south coast of England, elsewhere recorded from Biscay to the Mediterranean. Please notify any new records. Similar Species: This unobtrusive little anemone is easily mistaken, at first glance, for several other species and consequently may have been overlooked in the past. Sagartia spp. have suckers on column. Diadumene cincta, Haliplanella lineata and Metridium senile have column divided into scapus and capitulum, with a parapet and fosse. Varieties of any of these anemones may bear a slight superficial resemblance to Aiptasiogeton. Tentacles are not readily retracted. Acontia present but not readily emitted. Smooth column not divided into regions. Picton, B.E. & Morrow, C.C. (2016). Aiptasiogeton pellucidus (Hollard, 1848). [In] Encyclopedia of Marine Life of Britain and Ireland.